The company that invented Mobile Fryer and Cooking Oil Management is rapidly expanding its eco-friendly service. 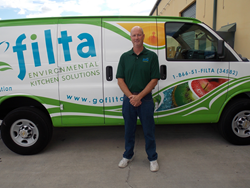 Filta Environmental Kitchen Solutions has opened a new location in Morristown, NJ. Filta Environmental Kitchen Solutions, the company that invented Fryer Management provides service to commercial kitchens across the United States and around the world. The company recently opened a new location in Morristown, NJ. The franchised location is owned and operated by Austin Jennings, a longtime resident of Morris County, NJ. Mr. Jennings is no stranger to customer service and business dedication, having worked with Wyndham Worldwide for the last 17 years, prior to joining Filta. The new Morristown franchise is growing quickly and has already begun servicing accounts including Rod’s Steak and Seafood Grille, The College of St. Elizabeth, Delbarton School, Citi, and Morris Tap & Grille. “My goal is to bring awareness of a great service to a region of the country that has not fully benefited from it previously. I intend to educate my customers on the cost and environmental benefits Filta can provide while providing an outstanding customer service experience,” Mr. Jennings stated. The new location currently offers the FiltaFry service, which is Filta’s proprietary mobile based cooking oil micro-filtration and vacuum based deep fryer cleaning service and the FiltaBio service which is waste oil recycling without the bin. When a commercial kitchen uses both services they can prolong the useful life of their cooking oil and eliminate the traditional waste bins and barrels that can cause spills and fines. Later this year, Mr. Jennings will begin offering the FiltaCool service which reduces heat and humidity in walk in coolers, prolonging the shelf life of the food and life of the cooler. For service inquiries in Morristown and the surrounding areas, call 973-900-3108 or email filta409(at)filta(dot)net.